Carefully wash and pat dry strawberries. Do not remove stems. In medium saucepan, melt white chocolate chips over low heat, stirring frequently, until smooth. Holding by stem end, dip each strawberry into white chocolate. Set on wax paper to dry. Meanwhile, in a food-storage bag, microwave semi-sweet chocolate chips until melted. Snip off tiny corner of bag, and gently squeeze bag to drizzle chocolate over white chocolate and strawberries. Store in refrigerator. 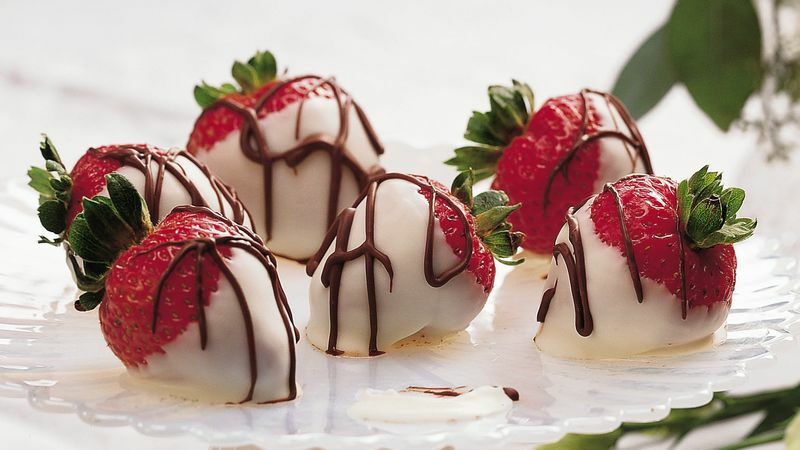 Change the look of this luscious dessert when you dip half of the strawberries in white chocolate, half in dark chocolate, and vary the drizzle. Looking for a creative way to surprise your Valentine this year? Look no further than your fruit bowl! Combine chocolate and fresh fruits to make the ultimate sweet treat for your sweetie. You won’t believe how easy and tasty these quick combos can be! Creamy chocolate and juicy strawberries are a tough flavor mash up to beat. They have a long history in the romantic food category—so these are a must to include in your fruity Valentine’s line-up. Melt your chocolate. I like to use a “double broiler” method. The chocolate is melted in a metal bowl over a pan with water being warmed on the stovetop. Take care to not allow any water to touch the chocolate and stir the chocolate often. When the chocolate has melted, remove the bowl to avoid overcooking. Dip strawberries one at a time, and line them on a tray covered with waxed paper to cool. Give each strawberry a splash of Valentine color with some red sprinkles (before the chocolate cools!). Or, if you are feeling very fancy, streak the dried chocolate with white or red stripes of candy melts. Oooh la la! Slice bananas into chunks. Spread a little peanut butter onto each chunk, and stick them in the freezer for 20 minutes. Melt your chocolate as above. When it’s time to dip, just take a few banana chunks out of the freezer at a time. They’re much easier to dunk in chocolate if the banana and peanut butter are firm. And using two forks to dip each banana works best. Finally, decorate each “bon-bon” with sprinkles and store them in the freezer until you’re ready to serve your sweet surprise. They taste best when the bananas are frozen! Next, spread a thin layer of peanut butter over one side of the apple slice, leaving enough space for you to get a grip on it. Then dunk the apple into the melted chocolate until the peanut butter is covered. Add your festive sprinkles, and let cool. These fruity treats are dessert dynamite and will satisfy any sweet tooth. They’re also much healthier than a box of chocolates (…just sayin’). Enjoy!